Department of Economics, Fatih University, Istanbul, Turkey. Received August 30th, 2011; revised October 10th, 2011; accepted October 25th, 2011. Using a cross-section of Nasdaq and NYSE-listed foreign companies, we examine the impact of financial and innovation variables on the registration. We find a strong association between the variables and Nasdaq. This suggests that Nasdaq-type financial stock market has a link with the enterpreneurial ecosystem. The availability of high-tech firms is strongly associated with funding and research availabilities. In this paper, using a cross-section of Nasdaq and NYSElisted foreign companies, we examine the impacts of venture capital financial and innovation variables on the listing of stock markets. The analysis confirms the key findings of prior work, including the importance of worldclass research-oriented institutions and the crucial role played by venture capitalists. However, the contibutions of the paper are 1) the venture capital is an important determinant of listings due to the support of startups, however, the previous studies focus on the impact of stock markets on venture capital; 2) the existing of large sophisticated financial institutions is not suffucient for startups which need a long-term-free-interest investment; 3) Nasdaq-type stock market is relevant to the growth of startups rather than NYSE-type stock market; 4) the existence of long-term-free-interest funds may fail to support startups due to the lack of technological research. The successful of emergence of startups comes from two main resources: strong research institutions and venture capital funds (Figure 1). An innovation environment depends on the research institute, public policy, and innovation-oriented corporate investment . Venture capital investment is typically viewed as the most critical form of capital [2-4]. Venture capital availability shows the funding availability for entrepreneurs with innovative but risky projects. Kortum and Lerner  define venture capital as “equity or equity-linked investments in young, privately held companies, where the investor is a financial intermediary who is typically active as a director, an advisor, or even a manager of the firm”. Figure 1. The ecosystem promoting entrepreneurial capitalism. equity investment . In the US a typical software start-up often required $5 to $6 million, most of which was spent on product intorduction, trade incentives to gain distr ibution and the advertising . Principles of a banking system and even a stock market do not allow to finance startups. Banks require monthly interest payments. This market failure occurs because the significant uncertainties of R & D lead private investors to allocate suboptimal amounts of finance to research . Therefore, big companies rely on external R & D.
Startups take new innovations to market and could be important conduits to exploit benefits from technological breakthroughs. 95% of all radical innovations since WWII have arisen from startup companies rather than large ones . Given this potential, the presence of venture capital could spur innovation because it could increase profitable opportunities from new discoveries. New technology startups are thus particularly risky and uncertain. Startups require access to human, intellectual, alliance, and financial capital [10,11]. Kortum and Lerner  report that venture capital could have contributed to 8% of industrial innovation in the late 1980s, even though it measured less than 3% of R & D during this period. Tang and Chyi  find that venture capital contributed to productivity growth in Taiwan. Venture-capital backed companies generate more export sales, more R & D, more jobs per dollar of equity than fortune 500 companies did . Venture capital may also provide management expertise or access to other capabilities that bolster the competitive advantage of startups that they fund . Another stream of research emphasizes that VCs are particularly good “coaches”. They are particularly skilled at injecting expertise and sound business judgment into startup ventures . Hellmann and Puri  find that venture capital backed firms change to outside management faster than non-venture capital-backed firms. They interpret this as evidence that venture capital offers value to their investees via “professionalization” of the management team. Another important issue with venture capital is scaling. The choice behind venture capital is to choose a selfgrowth business model that depends on the customer’s payment versus scaling with venture capital cash injections. Thanks to venture capital, a business can grow and can be listed on equity market very fast. Research institutes provide startups to sources of know-how and expertise . Baum et al. find that biotechnology startups able to establish upstream alliances with universities and other organizations with scientific and technological expertise and downstream alliances with pharmaceutical, chemical and marketing companies. Countries, which have increased their innovative capacity, have implemented policies that encourage human capital investment in science and engineering. A natural resource rich country may allocate an unlimited fund for investment without supporting innovative firms due to lack of research institutes. The Porter framework focuses on competitiveness by identifying four key driver: high-quality and specialized innovation inputs (i.e., research institutes), rewards successful innovators (i.e., intellectual property protection), domestic demand (i.e., sophisticated, quality-sensitive local customer base), and vertically and horizontally related industries (i.e., private R & D and venture capital) . 4) entrepreneurial capitalism, in which a significant role is played by small innovative firms. All stock markets do not play an important role in the emergence of startups. The Nasdaq symbolizes the enterpreneurial, dynamic and competitive economic structure in which venture capital and research opportunities need to be dominant. The NYSE symbolizes the old, stable and bureaucratic firm structure. Big firms use normal banking system and non-radical innovation. Those countries succeed in listing so many companies on Nasdaq will have different ecosystem than those on NYSE. Nasdaq represents entrepreneurial capitalism and NYSE represents big-firm capitalism. 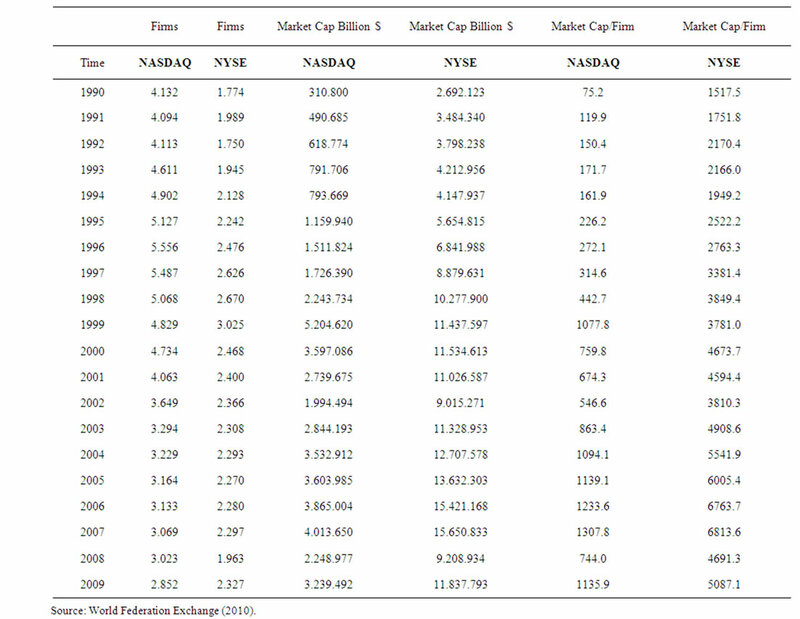 Table 1 shows the number of firms, the market cap and market cap per firm in Nasdaq and NYSE. In NYSE, there are 2280 firms whereas in Nasdaq there are 3133. The market cap of NYSE is US$12 trillion and the market cap of Nasdaq is US$3.5 trillion, less than one-third. The market cap per firm in NYSE is approximately 5 billion dollars and the market cap per firm is less than 1 billion$ in Nasdaq. 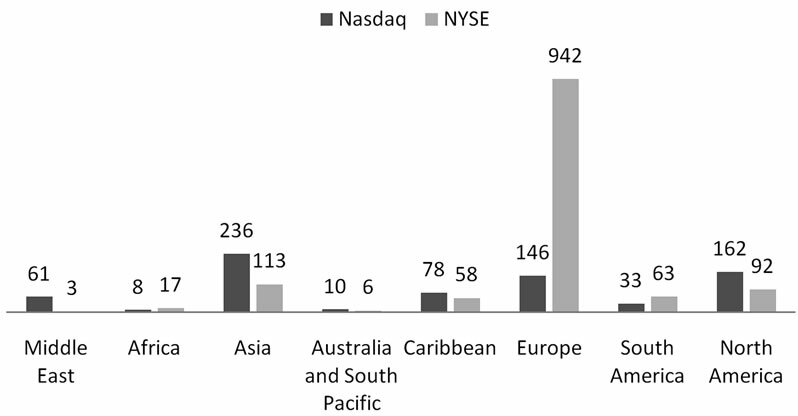 Figure 2 demonstrates the distribution of firms in Nasdaq and NYSE in 2010 at the regional base. Nasdaq is consistent with the wealth distribution on the planet and new emerging markets. With the rising power of China, that nation has become the leading region in the technology-based stock market (Figure 3). Europe follows Asia. However, NYSE represents the power of old continent. Europe is the leading continent (Figure 4). Table 1. Firms, market cap and market cap per firm in Nasdaq and NYSE (1990-2009). Source: Nasdaq and NYSE (2010) (number of firms). Figure 2. Regional distribution of Nasdaq and NYSE (North America excluded). Figure 3. Major countries/regions in Nasdaq. Figure 4. Major countries in NYSE. few countries. The dominant countries are Israel in the Middle East, South Africa in Africa, Bermuda in the Caribbean, and Brazil in South America (Figures 3 and 4). We conclude that there is greatly unequal technology and capital distribution in the world (see Table 1 in appendix for the list of countries). The comparison of Nasdaq and NYSE shows another interesting finacial distinguish regarding the European and the emerging Asian countries/regions (China, Hong Kong, India, Singapore, S. Korea, Taiwan). Source: WEF among 133 countries (2009). Figure 5. 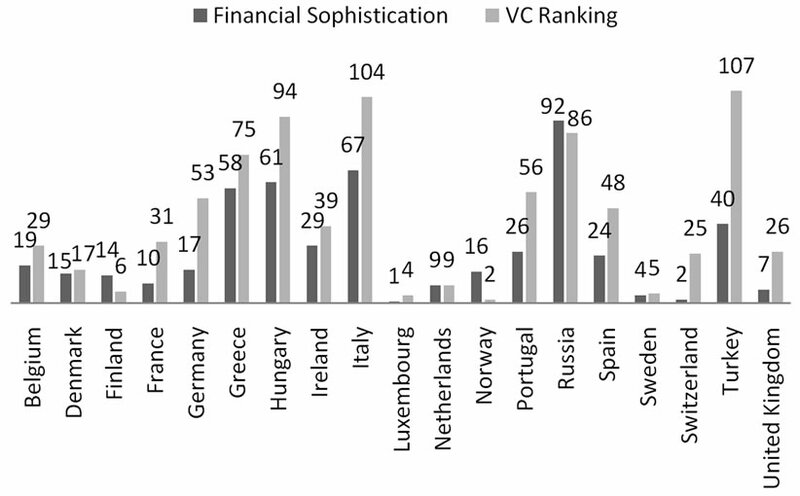 The comparison financial sophistication and VC availabilities in Europe. Source: WEF among 133 countries/regions (2009). Figure 6. The comparison financial sophistication and VC availabilities in Asia. availability vastly exists. For example, Hong Kong, Singapore and Taiwan are the top countries/regions in venture capital category. China is a backward country in the financial sophisticatin list (78th) but its position is much better in venture capital list (38th). Therefore, Europe represents the big-firm capitalism and Asia represents entrepreneurial capitalism or the transition from stateguided capitalism to entrepreneurial capitalism . In continental Europe, enterpreneurs actively face regulatory restrictions where investors do not welcome initial public offers by young firms without long histories of positive earnings . Venture capital is not a miracle solution given its great contibution to startups. By 1990, just 5% of the INC. 500 fastest growing companies in America were backed by venture capital. In the meantime, venture capital favors late stage investment rather than early stage . Another concern about venture capital is about the primary role: venture capital just select winners orather than support winners [10,11]. Besides venture capital and research institutes, there are other important factors for startups including higher education, patent and copyright laws, the antitrust laws, taxation of capital gains, and the openness of the economy to international competition . Section 2 shows empirical methodology and data. Section 3 presents results and Section 4 offers a concluding discussion. We consider a cross section of 45 countries on Nasdaq and NYSE (we exclude 6 countries due to the lack of data). Our dependent variable is the number of firms registered on Nasdaq and NYSE. Our independent variables are financial and innovation measures of 2009 from World Economic Forum’s Executive Opinion Survey and reported in the World Economic Forum’s Global Competitiveness Reports (WEF, 2010). The major work of intangible asset variables (quality of institutions, property rights, government regulations, corruption) are done through survey questions by different institutions such as World Bank, Transparency Institute and WEF. 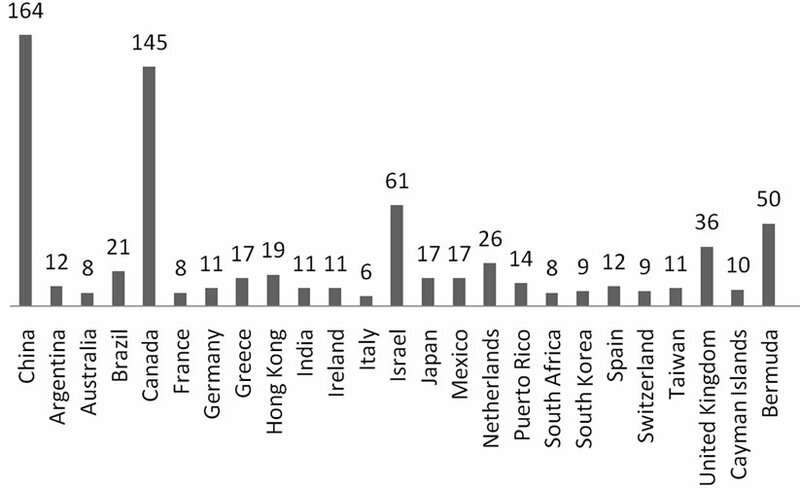 Jeng and Wells  search the determianats of venture capital for a sample 21 countries. So, venture capital is considered as dependent variable. They find that initial public offers are the strongest driver of venture capital investing . It is certainly true that the existing of stock markets lead the enlargement of venture capital . An investment in a firm goes public provides an average cash return 3$ with an average holding period of 4.2 years. An investment in a acquired firm, an average cash return 1.4$ over a 3.7 years mean holding period . The United States has both an active venture capital industry and well-developed stock markets. Japan and Germany have neither. Venture capital flourishes especially when venture capitalists can exit from successful portfolio companies through initial public offerings (IPOs), which in turn require an active stock market . However, Israel and Singapore have experiences a growth of venture industries without having strong domestic public equity markets . Causality may go in both directions. Not only does venture capital cause stock market enlargement, but stock market growth makes more sophisticated venture capital funds. In our paper, we overcome this causality issue by using the foreign stock markets. Additioanlly, we use the domestic stock market as a control variable. The listing potential of the Nasdaq and NYSE markets as a foreign company cannot increase the venture capital, the research opportunities and number of start-ups. A young firm or venture capitalists cannot put this option as a viable exit strategy since there are only 1000 number of foreign firms in Nasdaq and NYSE. Obviously, the probability as an exit strategy is extremely weak. Survey questions in WEF pertain to finance, technology, human resources, government regulation, etc. The countries are listed from the best to the worst in a section. In regards to financial measure, we use financial market sophistication (Fin_Sop), venture capital availability (VC) and financing through local equity market (Loc_Eq). Financial market sophistication is a general opinion about the financial conditions about countries. We take financing through local equity market variable because some countries may have limited local equity market and therefore they may use the US equity markets for listing their firms . In regards innovation measure, we consider capacity for innovation (Innov_Cap), Quality of scientific research institutions (Res_Ins), University-industry collaboration in R & D (Uni_Ind), Gov’t procurement of advanced tech products (Gov_Proc). These variables may have several policy implications. To control general economic conditions, we use macro economic variables such as the GDP (GDP) and GDP per Capita (GDP_Capita) of 2009. Some have seen economic growth, itself, as a catalyst for financial development. Table 2 presents findings for the financial variables and Table 3 shows results for the innovation variablesfor Nasdaq and NYSE. The first column of Table 3 presents the baseline specification for Nasdaq. The coefficient on GDP is positive and significant and GDP_Capit is not statistically significant. The size of countries does matter for the listing. The Fin_Sop (first column) and Loc_Eq (the second column) are not statistically significant. However, VC is statistically significant in column 3. The sign is negative because those countries which are advanced in this cathegory (get low ranking in survey listing of WEF) register many companies in Nasdaq or NYSE. When we include Fin_Sop and Loc_Eq, VC continues its significance in the fourth and fifth column. Other things being equal, venture capital is prominent in Nasdaq. 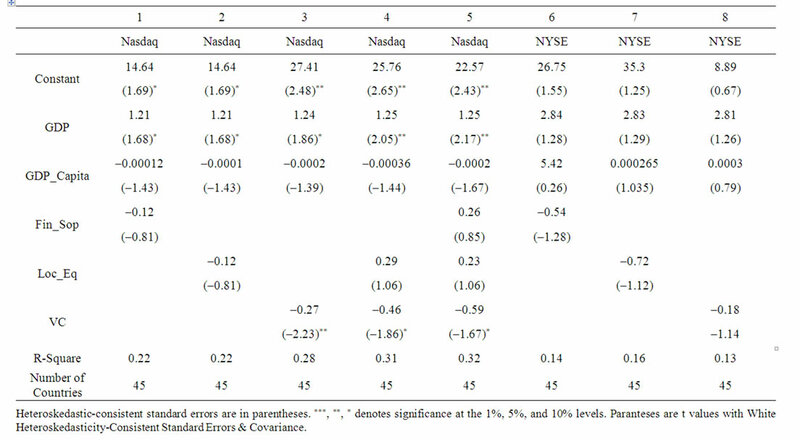 Financial variables’coefficients are not statistically significant in later specifications for NYSE in column 6th, 7th and 8th. The coefficient on GDP lost its significance either. Table 2. The impact of financial variables (dependent variable: number firms listed on Nasdaq and NYSE). Table 3. The impact of innovation variables (dependent variables Nasdaq and NYSE). 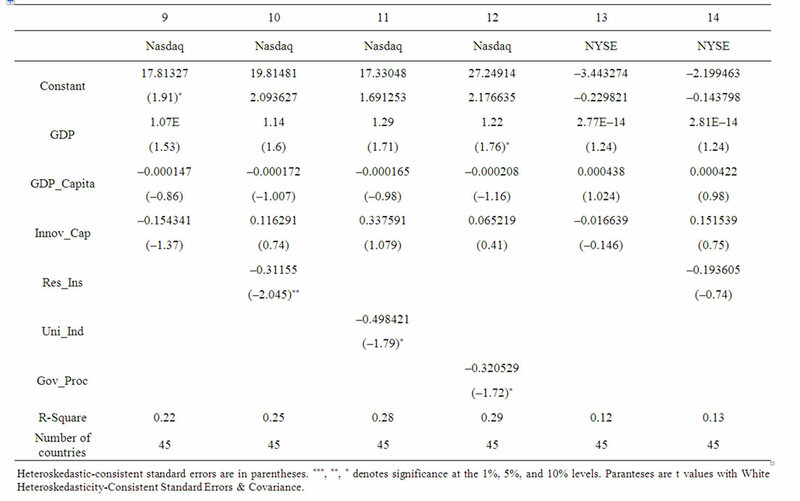 significance for NYSE as Table 2 for financial variables. The link between financial-innovative ecosystem and listing is much stonger in Nasdaq than the link in NYSE. Small and innovative firms as a characteristic of enterpreneurial capitalism found an exit opportunity in Nasdaq. The argument of the paper is that the successful of emergence of startups comes from two main resources: strong research institutions and venture capital funds. Implementing brain power into the market requests a trial and error approach. If the risk is only on the shoulders of entrepreneurs, they will avoid risk. Our view is that the main investment strategies for developed and developing countries to create an ecosystem that thrives on innovative start-up companies. The existence of venture capitalism allows for trial and error. The normal banking sector will not finance such long-term and risky investments because it is under the constraint of short-term goals. Too many good ideas fade away before coming to market since there are no opportunities for trial and error Poor people cannot find the opportunities to test their ideas, and rich people preserve their wealth. If failure is not tolerable, nobody will ever try anything. Perhaps developing venture capital markets is one conduit to promote economic development. In the old model, the developmental state was portrayed as having a strong relationship with the leading big firms, but in the new approach, growth lies with innovative firms . In this paper, using a cross-section of Nasdaq and NYSE-listed foreign companies, we examine the impacts of venture capital financial and innovation variables on the listing. Baumol et al. distiguished type of capitalism in four categories: state-guided capitalism, oligarchic capitalism, big-firm capitalism, and entrepreneurial capitalism. Nasdaq represents entrepreneurial capitalism and NYSE represents big-firm capitalism. 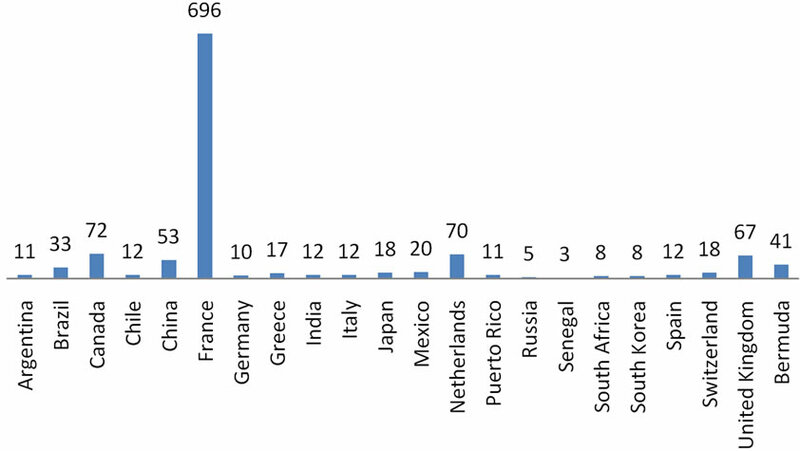 Countries with more advanced venture capital and R & D institution register more comapnies on Nasdaq rather than on NYSE. The link between financial-innovative ecosystem and listing is much stonger in Nasdaq than the link in NYSE. The general financial variable is not prominent in Nasdaq but venture capital, research quality, university-industry cooperation and government procurment technological product are effective. Small and innovative firms as a characteristic of enterpreneurial capitalism found an exit opportunuty in Nasdaq. Nasdaq is consistent with the wealth distribution on the planet and new emerging markets. With the rising power of China, that nation has become the leading region in the technology-based stock market. Europe follows Asia. However, NYSE represents the power of old continent. Europe is the leading continent in NYSE. The comparison of Nasdaq and NYSE shows another interesting finacial distinguish regarding the European and the emerging Asian countries/regions (China, Hong Kong, India, Singapore, S. Korea, Taiwan). European countries are sophisticated in financial instruments but they remain weak in venture capital. For instance, France and Germany are the 10th and the 17th country in the survey regarding financial sophistication among 133 countries but their placement in venture capital availability are the 31th and the 53th. On the other hand, in Asian countries/regions, the venture capital availability vastly exists. For example, Hong Kong, Singapore and Taiwan are the top countries in venture capital category. China is a backward country in the financial sophisticatin list (78th) but its position is much better in VC list (38th). Therefore, Europe represents the big-firm capitalism and Asia represents entrepreneurial capitalism or the transition from stateguided capitalism to entrepreneurial capitalism . The economic and technology environment in Asia is very pleasant for startups. Greater emphasis should also be placed on studies measuring the effects of venture capital and research institution quality on economy. P. Anderson, “Venture Capital Dynamics and the Creation of Variation through Entrepreneurship,” In: J. A. C. Baum and J. E. Dutton, Eds., The Embeddedness of Strategy: Advances in Strategic Management, JAI Press, Greenwich, 1999, pp. 303-322. D. A. Shepherd, R. Ettenson and A. Crouch, “New Venture Strategy and Profitability: A Venture Capitalist’s Assessment,” Journal of Business Venturing, Vol. 15, No. 5-6, 2000, pp. 393-410. T. L. Amburgey, T. Dacin and J. V. Singh, “Learning Races, Patent Races, and Capital Races: Strategic Interaction and Embeddedness within Organizational Fields,” Advances in Strategic Management, Vol. 13, 1996, pp. 303-322. Venture Capital Association, US, 1998. W. O. Grave and J. A. Timmons, “Venture Capital at the Crossroads,” Harvard Business School Press, Boston, 1992. D. Berlitz, “Political Choice and Strategies for Growth in Israel, Taiwan, and Ireland,” Yale Press, New Haven, 2006. J. A. C. Baum, T. Calabrese and B. S. Silverman, “Don’t Go it Alone: Alliance Networks and Startups’ Performance in Canadian Biotechnology,” Strategic Management Journal, Vol. 21, 2000, pp. 267-294. W. J. Baumol, R. E. Litan and C. J. Schramm, “Good Capitalism, Bad Capitalism, and the Economics of Growth and Prosperity,” Yale University Press, New Haven, 2007. M. E. Porter, H. Takeuchi and M. Sakakibara, “Can Japan Compete?” Diamond Publishing, Tokyo, 2000. J. Lerner and A. Gompers, “The Venture Capital Cycle,” MIT Press, Cambridge, 2004.